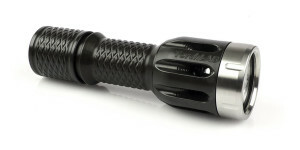 As a certified SureFire Flashlight nut, I have been a longtime admirer of the offerings from OVEREADY. 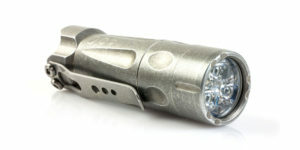 It’s fair to say that for many flashaholics, myself included, the Oregon company’s custom parts represent the top of the line when it comes to custom and semi-custom flashlight parts. Needless to say I was thrilled when I received an e-mail stating they had sent some of their products to see what I thought about them! We will begin with OVEREADY’s Custom Hard Anodized SureFire 6P which is available in “Fire Red” and “Ice Blue” finishes. The sample provided for review is the Fire Red version. The Fire Red 6P is sold as a complete “host” (without LED drop-in) and is ready to be used with almost any of the commonly available P60 style drop-ins. Since actual performance will vary depending upon the drop-in used, this review will focus on the host itself. The Fire Red 6P is an attention getter and makes the most of any first impression. The flawless finish is evenly applied and the three main components – bezel, body, and tail – appear perfectly matched with regard to color. Although the photos may make the head appear darker than the body, this is only because the body knurling reflects light differently and appears brighter. The perfect anodizing extends to the hidden areas of the host as well, including the head and tail threads along with the inside of the bezel and tailcap. The body is bored to accommodate 18mm (nominal) rechargeable batteries and includes a retention lip to keep the cells in place when the head is removed. The bore is actually smoother than most of my stock SureFire lights. Double O-rings are installed at the tail for improved water resistance. From looking at the results it’s obvious that the custom finish is much more than simply a fresh coat of “paint” on a standard 6P. The lights are completely disassembled. 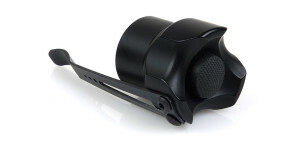 This includes removing clips and rings (such as on the SureFire C2), removing the bezel ring and lens from the head, and the switch from the tailcap. This requires special care to avoid damaging the existing parts as some may be reused when the lights are reassembled. The parts are wiped down, inside and out, to remove any grease and given an ultrasonic bath before they are inspected, packed, and shipped to the anodize shop. Once at the shop, the parts are acid cleaned before the factory Type II anodize is stripped from the parts. The new hard-anodized finish and color are applied. The lights are then inspected and returned to OVEREADY. 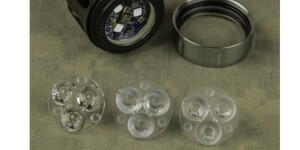 The parts are ultrasonic cleaned again and inspected for quality before they are partially reassembled, taking care to color and texture match the body, head and tailcap of each light. The job still isn’t complete as each light is customized based upon the order. Therefore, only after an order has been placed, the light can be outfitted with the customer’s choice of bezel ring, lens, and tail switch. After a final inspection and cleaning (including alcohol wipe) the host is finally ready for shipping to its new home. The sample I received is outfitted with an Ultra Clear Lens (UCL) held in place by a smooth black stainless steel bezel ring coated with titanium aluminum nitride (TAlN), the same stuff used to protect drill bits from wear. Several other finishes are available including natural titanium, copper, brass, and plain stainless steel. Crenelated bezels are also available. 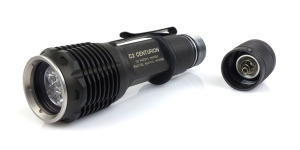 To control the light, customers have a choice between the original SureFire Z41 switch, the ZeroRez Twisty (ZRT), the ZeroRez Mounty (ZRM), and the well-regarded McClicky switch. This sample was provided with the ZeroRez Mounty. Like the original ZeroRez switch, the ZRM is machined from a solid chunk of brass to minimize electrical losses between the battery and tailcap. Since this means there is no spring, the switch now operates only as a “twisty” and no longer has momentary capability. However, what makes the ZRM truly unique is the 1/4″ tripod socket cut into its center allowing hands free use when the light is mounted to any tripod or attachment with 1/4″ threads. The ZeroRez switches deserve their own review so I won’t go into all the details here but suffice to say that there are a ton of accessories that can use this feature with the only limit being your imagination. My favorite so far is the LumaLabs PodMount & Strap Ring which provides a handy place to attach a lanyard or secure the light to your gear. With the attachment removed, the tailcap is perfectly flat and allows the light to tailstand. Since it’s still a SureFire underneath the custom coating, there have been no major surprises when using the Fire Red 6P. All parts go together easily and the twist tailcap works smoothly. Any accessories or attachments that work with a standard 6P should work with the Fire Red 6P as well. I was able to test the host with a variety of drop-in LED modules from Malkoff Devices, CustomLites, and others without issue but for some reason my Mac’s Custom Triple refused to work. After comparing it to the other drop-ins I realized the Mac’s Triple is actually 1/4″ shorter than the others and its center spring was not long enough to push the battery back into the contact at the tail. The Mac’s Triple was the only drop-in that did not work perfectly. This highlights the fact that any drop-in used with the ZeroRez Mounty must have a good spring as that is the only thing that keeps the battery from moving around when the switch is disengaged. The Custom Fire Red 6P and its Ice Blue brother offer the rock solid dependability and reliability of the SureFire 6P Original but allow their owners to customize them based on their individual preferences. The lights don’t come cheap, starting at around $120, but considering the amount of labor involved, it does not seem excessive. Especially when considering it typically costs $20-$40 just to have a SureFire 6P professionally bored to accept 18650 batteries. I have always had a high opinion of OVEREADY, both the company and their products, and have made several purchases from them in the past. However, this is my first experience with one of their custom hard-anodized SureFire hosts and I am very impressed with what I have seen so far. As a fan of the Kentucky Wildcats I’m inclined to dislike the color red but there is no denying that the custom finish on this 6P looks terrific! For more information about the Fire Red 6P or their other products, visit the OVEREADY website or use the links to specific products below. Share your thoughts or questions in the comments section below. Thanks for reading! 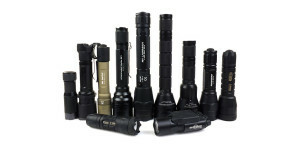 Posted in Flashlight Reviews, OVEREADY and tagged Flashlight Upgrades, OVEREADY, Surefire.